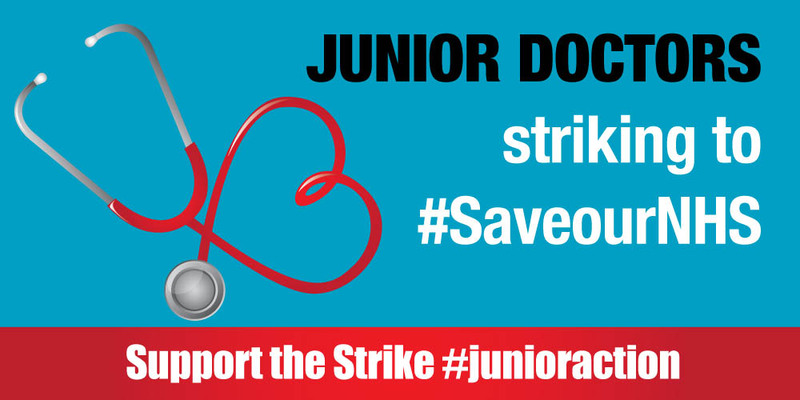 Barnsley Trades Council is calling on trade unions to send delegations to the Gawber Road entrance of Barnsley Hospital at 8amonwards on Wed. February 10th to show solidarity with the junior doctors’ strike and picket. Bring your union banners and flags and make your own placards. 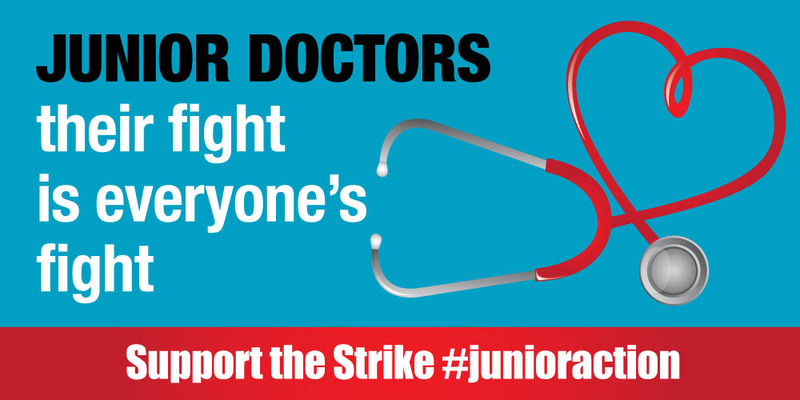 Around 25 trade unionists joined the striking doctors last time – it would be great if we can make that number bigger. Protest 12pm – 1pm Thursday Feb. 11th Town Hall Steps – (below the fountains). Barnsley Trades Council has organised a protest against the Tories’ anti Trade Union Bill as part of a national TUC day of action. We are calling on unions to send delegations, bring banners and placards and come prepared to speak. We have to defend our unions and defend our right to strike. That is why solidarity with the doctors is so important as well as defying the Tories’ anti trade union laws. Barnsley Green Party member Dominic Wood, on support for today’s Junior Doctor’s strike. Under the new contracts being offered, Student Doctors would have the EU legislative legal protection removed that currently prohibits the working of more than 48 hours a week. The reason for this legal prohibition is the well known and documented fact that tired doctors can kill patients. Unwittingly. Accidentally. Through being pushed to work longer hours than their mental and physical capacities can sustain. 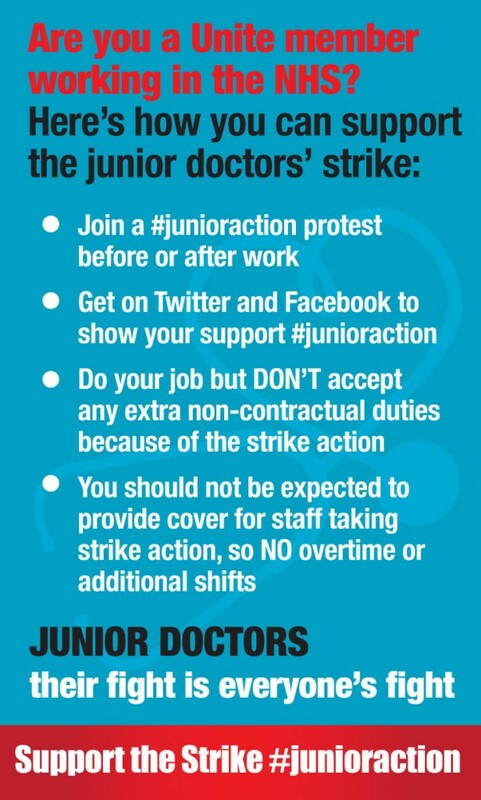 That is why, said a Junior Doctor training in anaesthetics, we are striking in Barnsley today and on the 26th. We care about patients. We came into this profession because we want to help people and patient safety is paramount. Tired doctors can’t work to the best of their ability, much as they would like to do so. Think about Patient Safety please, Mr. Cameron! A call from the BMA to all Unite Community activists – WE NEED YOU! 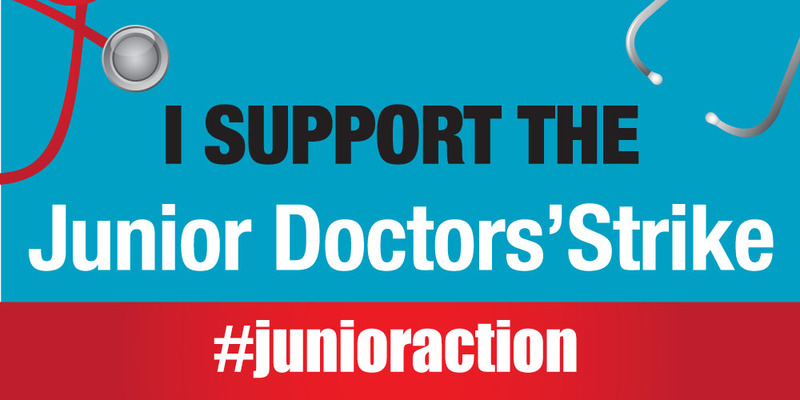 Junior Doctors across England will be commencing industrial action on Tuesday 12th January. We are opposing this government’s attempt to impose an unsafe new contract on the medical profession. It is our view that the proposed contract represents an existential danger to the NHS as an institution. You may be aware that the BMA had initially suspended its planned industrial action at the start of December and returned to talks with the Department of Health. That decision was made in good faith. However, over the last few weeks, in the course of negotiations with Government we have encountered only intransigence. It is clear that the government perceives our contract issue as pivotal for its attempt to “reform” the NHS towards a neoliberal, commercialised system. It is therefore evident to us that we have no choice but to transform our 98% ballot mandate into action. The developments of the next few months will have consequences stretching far into the future. This government is wilfully putting at risk our patients’ safety, the tolerability of our working lives as NHS workers and the very viability of the NHS as a publicly-funded, publicly-provided service. The coming period will be the ultimate test of the BMA’s resolve as a Union. However, we remain mindful of the fact that the BMA is not an abstract entity operating in isolation from wider political developments. There is no way that we can win this on our own. We need all concerned citizens, activists and trade unionists to stand alongside us in this fight. Over the last few months we have been in dialogue with many trade unionists throughout the country and we have been enormously grateful for their support both at a local and national level. The public messages of support from our allied health worker colleagues, the firefighters, the teaching unions and the TUC and TUCG unions have galvanised junior doctors. We are therefore well aware that all eyes are upon us and that the institutions which represent the wider working class stand with us in solidarity. We are in no doubt that Osborne, Cameron and Hunt will use the proposed doctor’s contract as a tool for achieving the destruction of safe terms and conditions throughout the NHS and throughout the public sector. The Conservative Party is attempting to stretch the NHS into an ostensibly 7-day elective service whilst simultaneously launching the biggest assault on NHS resources in its history. The politics of austerity represents a clear and present danger to the nation’s health. A victory for the Junior Doctors would signify the first real crack in the entire edifice of austerity in the UK. Please stand with us. And when you need us, ask us. We will stand by you. On behalf of the entire BMA we thank you all for your incredible support so far. Many of you will have seen the details with regards to the planned action and I will reiterate them below. We invite you to come out and display your visible support for us on the days of action. •The aim is to picket all major hospitals in England on all three days of proposed action. 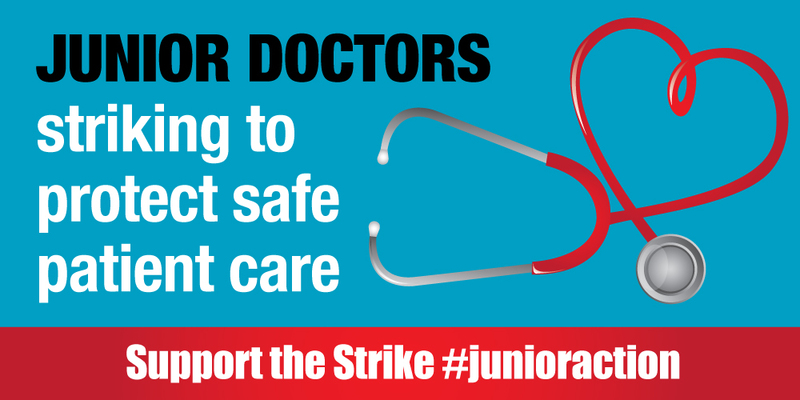 Pickets will be in the vicinity of the main entrances and will start at 8am, continuing until at least 12.30pm. However, many picket sites will continue into the evening, especially at the larger hospitals. 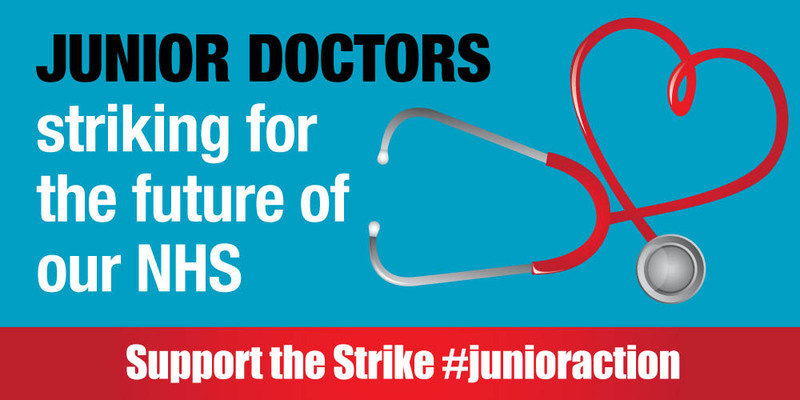 •Along with the pickets there will be parallel “Meet the Doctors” events at nearby transport stops or public spaces. We will direct you to these events from the picket. •Please turn up on the days of action, and give us your support. We will then inform you if other local events are planned on the day. If you are an allied health worker, trade unionist or campaigner please do consider bringing along the banner representing your organisation, your working uniform or similar. We would appreciate it however if banners in explicit endorsement of specific political parties are not displayed and that any selling of campaign literature such as newspapers is relatively discreet. •On the days of action, please do debate us, educate us and invite us to address your colleagues in your workplace or trade union branch. Just as the social democratic consensus in this country began with the inception of the NHS in 1948 so too will the NHS be the site of Britain’s last stand against the all-consuming forces of austerity. Solidarity is the antidote to the cynicism of those in power. Now is the time to stand together in a common defence of the NHS. If not now, when? Dr Yannis Gourtsoyannis, Member of BMA Junior Doctors Committee National Executive. Please share these memes on social media to show your support. Comments Off on A call from the BMA to all Unite Community activists – WE NEED YOU! Cuts to young people’s health services are being planned with the possibility of privatisation also Unite and Unison are planning resistance to the cuts along with community save our NHS campaigners press release below. Defend Children’s Health Services in Barnsley – a message on behalf of local Health Visitors and School Nurses. On 1st October Barnsley Council takes on responsibility for commissioning (planning and paying for) Health and Wellbeing services for children and young people (0-19). This includes Health Visiting, School Nursing and the Family Nurse Partnership that works with young mothers (aged 19 & under). The service is currently commissioned by the NHS and provided by South West Yorkshire Partnership NHS Trust (SWYPFT) and costs around £6.5 million per year. On 1st October Barnsley Council takes on this responsibility. But even before it has taken on the responsibility for it Barnsley Council has put the service out to tender, with bids to provide the service after June next year being due in on 5th October. Apart from the fact the service could be privatised and provided by a company such as Virgin Health the Council have said they will not accept bids to provide the service in the future costing over £4.8 million pounds per year. That is a £1.7 million pound cut to start with, though the Council also wants the children’s oral health service including as well, and says in the contract it will withhold up to 1.25% of the money due if it pays it’s provider promptly. Nearly £2 million pounds are being cut from children’s health services by this move, almost a third of what is currently spent. This is on top of cuts to social work teams and Children’s Centres. We are writing this as the unions representing Health Visiting, School Nursing, The Family Nurse Partnership and their support staff. You cannot take nearly 1/3 of the money out of the budget without this resulting in a worse service to children and their families in Barnsley and the loss of over 30-40 qualified nurses and support staff. The Council might think there are some savings that can be made. But this scale of budget cut will leave an unsafe service and risk vulnerable children dying. The children of Barnsley deserve better than this. Please call upon your local Councillors and MPs to halt the tendering process and to put the money into the service that it needs. RCN (Royal College of Nursing), UNISON and UNITE representatives in SWYPFT. A number of us in Barnsley are trying to develop a Save Our NHS campaign here. A group of people has come together already and we plan to hold a Save Our NHS public meeting on Saturday 19th September, at 11am, in Barnsley Library. The aims of the meeting are to make people aware of the threat of cuts and privatisation, to identify the immediate issues that we need to be campaigning on locally, and to get more people involved in the group. We are very keen for the NHS trade unions to be involved. We would like to invite all Unite members to the meeting. Also, it would be great if someone from Unite working at Barnsley Hospital could speak briefly about how they see things (in a personal capacity if necessary). There will be two other people speaking (both in a personal capacity) – Alison Brown of Sheffield Save Our NHS, who works for the ambulance service, and Andrew Bogg, who works in telehealth for SWYPFT. The speakers will be followed by a discussion, where we hope that people will raise their concerns about the NHS. This article by Harry Leslie Smith originally appeared in the New Statesman. Don’t forget to join the March for the NHS in Leeds on March 28. Many of the major private health companies bidding for NHS services have tax avoidance measures ‘at the core of their activities’, research from Unite the Union has revealed. The shocking report exposes ten major health companies including the four biggest private hospital chains in the UK, and Virgin Care and United Healthcare both currently bidding for major clinical contracts. Tax expert Richard Murphy analysed ten private health firms actively bidding for and running privatised sections of the NHS. The research revealed that all ten make use of tax havens and extremely complex corporate structures to lessen their potential tax bill, while only two pay any significant tax in the UK at all. The companies analysed by the research are: Care UK, Circle, General Healthcare Group, HCA, Bio Products Laboratory Holdings, Ramsay Healthcare, Spire Healthcare, The Practice, Optum (United Health) and Virgin Care. Only two of the 10 companies (HCA and Ramsay) pay any significant tax in the UK because most of the others have structures that involve the payment of significant interest, much of it to offshore companies. However, all ten companies have links to offshore tax havens, including the Channel Islands, British Virgin Islands and Luxembourg, and all but one employ extremely complex corporate structures to potentially lower their tax bill. To make matters even worse many of these companies are US companies, or have strong US investment links, which means that the Government could be prevented from taking their NHS contracts back into the public sector unless the NHS is exempted from the trade deal TTIP.Virgin Care, a subsidiary of Richard Branson’s Virgin Group Holdings Ltd is revealed to have paid no tax on its last reported profits. Virgin uses 13 intermediate holding companies to distance the firm’s healthcare division from its parent company, based in the tax haven of the British Virgin Islands. Despite this arrangement Virgin Care provides 30 primary care services across England including GP practices, GP out of hours services, walk-in centres, urgent care centres (UCCs) and minor injury units (MIUs). Virgin is allowed to bid for a contract worth £280 million in East Staffordshire to treat patients with long term ailments such as diabetes and heart disease. Similarly Optum UK, a subsidiary of US giant United Healthcare, is bidding for a Staffordshire-based NHS cancer and palliative care contract worth £1.2 billion. Optum has paid zero tax on its reported profits and is linked to tax havens including the Cayman Islands though its parent company. Unite general secretary, Len McCluskey said: “It’s a national scandal that firms can bid for cancer treatment contracts while scheming how to siphon their profits out of the country into far flung tax havens. “Good government should do everything possible to protect taxpayer funded public services like the NHS from companies with links to tax havens. But the Tory government’s warped health and social care act has opened up the door to private companies with dubious tax arrangements. “Despite the NHS being under huge financial strain the Coalition government is behaving like an accomplice to private companies with tax avoidance structures in place. Spire Healthcare and General Healthcare Group, both registered in tax havens, received tax credits from HMRC wiping out payments they had made over the previous three years. Despite these arrangements, none of the companies surveyed have been excluded from bidding for NHS contracts. Since the Health and Social Care Act passed in 2012 billions of pounds worth of NHS services have fallen into private hands. Of the total contracts awarded since April 2013, more than half have gone to non-NHS providers according to the NHS Support Federation. A new EU-US trade deal, known as TTIP, could prevent the government from cracking down on these practises. Seven of the firms including Virgin and General Healthcare Group have US subsidiaries or investors, potentially allowing them to use the deal to prevent the government blocking their future bids or terminating existing contracts. For more information or a copy of the research paper contact Ciaran Naidoo on 07768 931 315 or Richard Murphy on 07775 521 797. Over one in four governing members of the Tory designed NHS Clinical Commissioning Groups (CCGs), which have responsibility for a budget of £65 billion, have links to a private company involved in healthcare. The comprehensive study carried out by Unite, has uncovered how financial interests are ‘running amok’ threatening the trust between GP and patient and the NHS because of the Health and Social Care Act. The Health and Social Care Act gave CCGs ​ responsibility for commissioning services and in doing so opened the door to conflicts of interest on a massive scale. CCGs are clinically led groups with GP representatives from their geographical area, managers and lay persons. This is the first comprehensive study of the new NHS commissioners’ external financial interests in private healthcare and proves that vested interests lie at the heart of the government’s Health and Social Care Act. Unite general secretary, Len McCluskey said: “The Tory designed Health and Social Care Act handed the NHS budget, worth tens of billions, over to Clinical Commissioning Groups and in doing so, created a monster, where personal financial interests run amok. “As a result our NHS is being privatised and unless David Cameron uses his veto to get the NHS out of the EU-US trade deal TTIP, the government’s sell-off will be irreversible. Dr Ron Singer, chair of the Doctors’ section of Unite said: “The Health and Social Care Act forced GPs into a business model that the vast majority did not want. “Most GPs want to spend their time caring for their patients not tendering out services and being part of a bidding war. “The government’s health act has created opportunities for exploitation by some CCG board members. At the same time some GPs have decided to become CCG members as a way to defend NHS services from privatisation and fragmentation. Unite looked at the registered interests of 3,392 CCG board members, the most extensive research of these interests undertaken. Of the 3,392 Board Members, 932 (27%) of CCG board members were found to have a link to a private company involved in healthcare including: 513 Company Directors, 140 business owners, 105 external work, 17 Partners, 15 Chairs, 10 Company Secretaries, 5 CEOs, 1 Trustee, 1 Financial Officer and 125 others including consultants. The study also found 409 (12%) board members are shareholders in such companies; a combination of businesses they own and external private companies, including providers of ‘Out of Hours Services’. Come and add your voice to the Save the NHS demo in Leeds on March 28th.